Pegas Scroll Band Saw - 14 Inch. Stand and first 2 blades included. Order now or before May 1 to secure the introductory price. ​The Pégas® Scroll Band Saw is a precision machine using Pégas® Scroll Band saw blades, the finest and most accurate blades ever produced. This unique and innovative concept is intended for informed users, from hobbyists to skilled professionals. Machine developed in Switzerland - made in Taiwan to Pegas specifications and quality requirements. 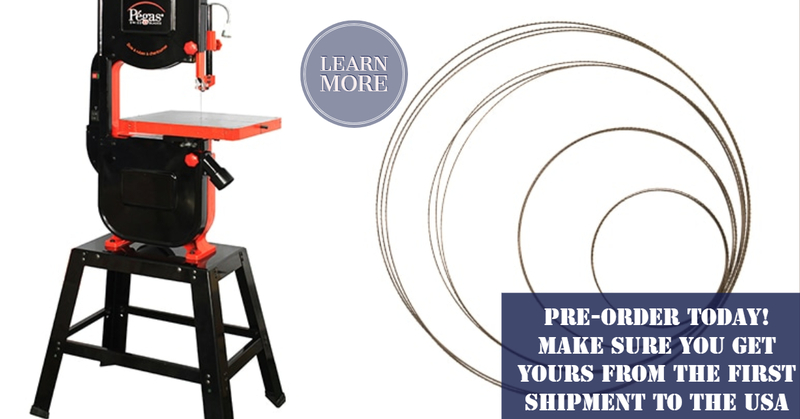 Band Saw Blades in addition to those included will be coming soon and available to purchase from Bear Woods Supply. Check back for details as the saw delivery date comes closer! The Pégas® guiding system is required whilst using Pégas® scroll band saw blades. The blade will be guided accurately for high-performance, sustainable sawing results. The top and bottom guides consist of a CNC-machined aluminium block and a special ball-bearing guide, featuring grooves along which the blade is guided above and beneath the table. Such high-precision guiding allows for the sawing of very complex shapes, curves and radiuses. The ball-bearings delivered with the machine feature two grooves of different dimensions, one being appropriate for blade #9, and the other for blade #12. Service directly from the manufacturer via their office in New Jersey, USA. Need support on the saw? We'll provide you with contact information to speak to trained service staff who also has the support of a highly trained technician. From time to time a part will need servicing beyond what we can help with by phone and sending parts. In those cases, we'll arrange for the saw to be sent to New Jersey. Bear Woods is the best choice for quality blades, clock parts, drill bits, the Pegas Chuck Heads and Much More!